Last time we learned how to customize Google Scholar so that the search engine will allow us to access the full text of the library’s journal articles even from off campus. 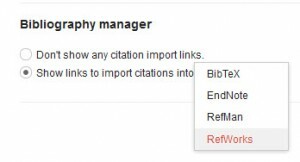 But did you know that you can export the citations you retrieve to several reference management software systems (such as RefWorks, EndNote, or even Bibtex) to make doing your bibliographies a snap? Click the SAVE button at the top of the screen. This returns us to the Google Scholar search box. Under each of our results we now see the Import into RefWorks link. Just click to capture the citation information into your RefWorks account. If you’re not already logged into RefWorks, you will receive a prompt to do so. What’s that? You don’t have a RefWorks account? You mean you’re still typing bibliographies the old fashioned way? Watch this brief video to see what RefWorks can do for you. Then click here to find out how to sign up for your own account. This reference also features the Click here for full text link. So even from off campus you will be able to access this Falvey Library subscription article.